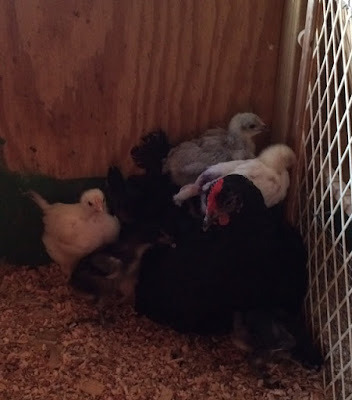 Homestead Bounty Blessings: MORE Broody Momma Drama! Oh, my goodness. In the 4 1/2 years of chicken keeping, I have never had as much trouble as now with my broody mommas. From leaving the nest to attacking babies. I am done. So grateful for my two steady mommas, Sassy and Gertrude. Gertrude was a mom once before but it's been a couple years. Sassy is my super mom. She has now raised at least 5 broods over the past two years. When she goes broody, I know I can count on her to hatch and/or take care of chicks for me. 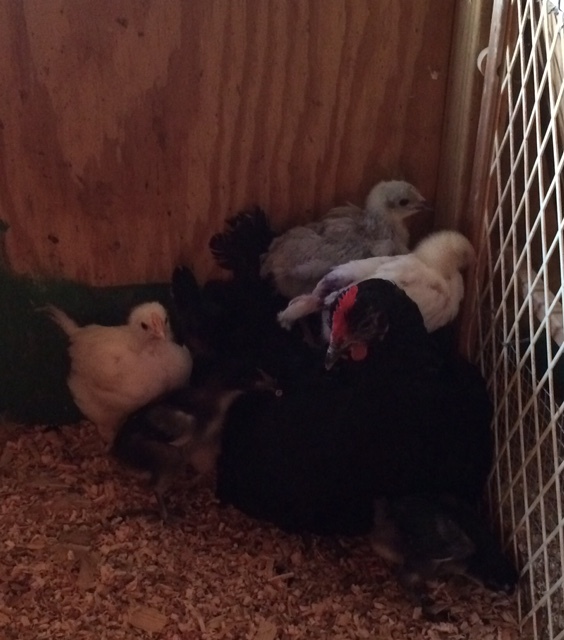 I had one final order of chicks for a broody mom that wouldn't get off the nest. She was a new mom and I suspected she may not make the cut. She is the one I suspected of injuring our first hatchling but I chalked it off to a failed hatch. I tried introducing chicks to her twice and she didn't seem to go for it so I gave them to other moms. When my final order of pullets came in I tried for the last time to give them to her. She attacked. We're done. I have her tagged and she will forever be forbidden to hatch eggs or sit in the future. It is what it is. Like I said, I'm just grateful for my trusty mommas. I thought I had it all figured out. Based on the ages and stages of the babies I had a plan to split them fairly evenly between my two mommas. We did the changes and introductions at night. All seemed well until . . . I went to release Sassy in the morning into her pen with her babies and she began attacking the new babies as they approached the feed with her current brood. I couldn't believe my eyes. This was my adoptive mom who graciously took Pip in when her mom rejected her. The new babies were almost the same age as her current brood so I thought it would be ok. I have learned that at a certain age, the moms just don't seem to consider them babies anymore and chalk them off as the enemy. Poor babies. We had to rescue them and give them back to Gertrude who was originally raising them. I had taken them from Gertrude so she could raise the new babies with a few of her smaller ones from her original brood. End result . . . Sassy kept her original 3 plus Pip, Gertrude now has her original 7 plus the 6 new babies! Poor Gertie is now in charge of 13 babies ranging from 1- 4 weeks old! She is such a trooper and great momma. She took them all in without a fuss and her current brood seem to be getting along with them just fine with no fighting or pecking. Never a dull moment in the chicken yard.